Vincent van Gogh, 1853 - 1890, painter, lived here 1873 - 1874. The house was up for sale in 2012 and the estate agents said the "property has been in the same family for more than 60 years and has many period features that would have been familiar to the Dutch artist, including fireplaces and outdoor lavatory ... 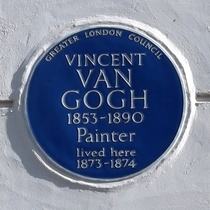 It has probably only changed hands twice since Vincent lived there. It needs total modernisation but a lot of features such as the fireplaces where he would have warmed himself on a cold night were covered up so they are not damaged in any way." 2019: The Guardian report that during renovation works documents, watercolours and a prayer book were found under floorboards. These are thought to relate to Van Gogh's period in the house.